This mini workshop was asked to be run by the Guardian Angels to allow you to connect at the time of the Full Moon to their wonderful realm. 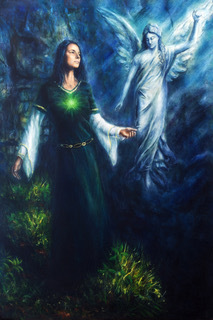 Often as lightworkers we work with our Guardian Angels at the start of our journeys but with so many wonderful energies to work with they can get a bit over looked at times. This mini workshop will include a channelled Guided meditation through Alphedia, personal channelled messages from your Guardian Angels and also a chance to harness the Full moon energy for healing. Worksheet is included. The full moon was on the 29/30th September and is known as the Harvest moon as it is the full moon closest to the Autumn Equinox in the northern hemisphere. It occured at 3.19am Universal Time (4.19am UK time). The energy was strong on both days and nights. This moon is an opportunity to let go of the past and courageously move forward. Your own Guardian Angels are the keepers of your light and watch over you, they know your divine mission and give guidance on all areas of you life. They ask to connect with you at this time to prepare the way for the energy shifts to come in the next three months. Using the crystals Rose Quartz, Selenite and Amethyst will help you connect to your angels.